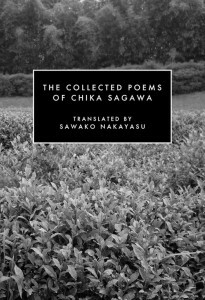 Sawako Nakayasu’s wonderful translation of The Collected Poems of Chika Sagawa, released earlier this year, was my first look at Sagawa’s work. Due to Sagawa’s untimely death, it is a slim volume, at 136 pages, but it’s definitive and is an excellent introduction to Sagawa’s work. Nakayasu includes an introduction to Sagawa’s life and work, and translates every poem and prose piece included in the 2010 Japanese edition of Sagawa’s Collected Works. Nakayasu’s introduction gives Sagawa’s basic biography and context for her work among her peers and cultural history. Not a complete biography, certainly, but is satisfying as an introduction to the work presented. Chika Sagawa was born in 1911 in Yoichi, Hokkaido, which is “in the very far north of Japan, nestled between the mountains and the sea, buried in deep snow for much of the winter.” She moved to Tokyo in 1928 and was introduced to the literary community by her brother. She became an influential member of the avant garde and Modernist scene and began publishing poetry in 1930. She was just 24, but her work has remained influential. Is the sound of a fern unfurling. Under a row of trees a young girl raises her green hand. In just two lines, Sagawa slows time and focuses the reader’s attention on a few important details: the trees, the girl, and her hand. By waiting to reveal the gloves, the reader is as surprised as the girl by the color of her hand. Under a row of trees a young girl raises her green hand, calling someone. Looking in surprise at her plant-like skin, she eventually removes her gloves. Elsewhere in the book, the poems “Beard of Death” and “Illusory Home” both open: “A chef clutches the blue sky. Four fingerprints are left.” Are these new poems or simply different drafts of the same work? Which was written first? Does it matter? By including these variations, Nakayasu gives us a glimpse at Sagawa’s process. Anyone interested in Japanese poetry would do well to add The Collected Poems of Chika Sagawa to his or her library. Nakayasu’s translations are sensitive and confident and her introduction serves its purpose well. I’m curious to see if more translations and more criticism of Sagawa’s life and work come out now that this fantastic collection brings her to a wider audience. 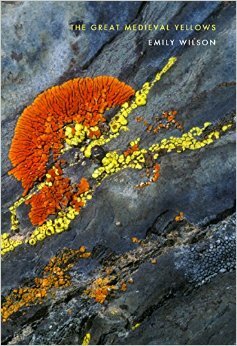 What are your favorite collections of translated poems? We are perfect because of our imperfections. but instead she’s getting pissed on her own watching the chat shows. She puts a pizza in the microwave and eats it off her knees. that’s where he finds her, fast asleep. Like Whitman, Tempest invokes a range of people and professions, setting them next to one another in a grand display of democracy. sticking out of a fluffy barrel. The effect of focusing on these nine characters is that they become elevated over the others, contradicting the democratic impulse found earlier in the piece. At their best, the cameo appearances are reminiscent of Nazim Hikmet’s singular novel-in-verse Human Landscapes from My Country, which features, in the course of over 15,000 lines, dozens of varied-length portraits of all kinds of Turkish people during the first half of the 20th Century. Tempest’s poem, by contrast, focuses on working class, probably white people (though, race is never mentioned), who surely don’t represent the whole of England’s diversity. 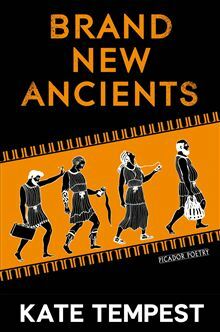 Despite a missed opportunity or two, Brand New Ancients is an ambitious piece and worth reading more than once, out loud, preferably with friends. Reading, one falls into the rhythm of the text, tumbling from moment to moment watching the lives of these characters unravel, re-ravel, and wrap around one another. Considering Tempest’s output this early in her career, it’s safe to assume there’s more where this came from, hopefully as genre bending and empathetic as Brand New Ancients. 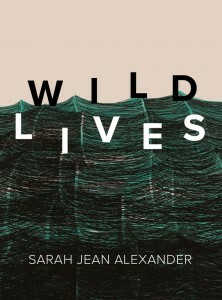 What other writers are pushing the boundaries of genre to create multifaceted, ambitious texts?